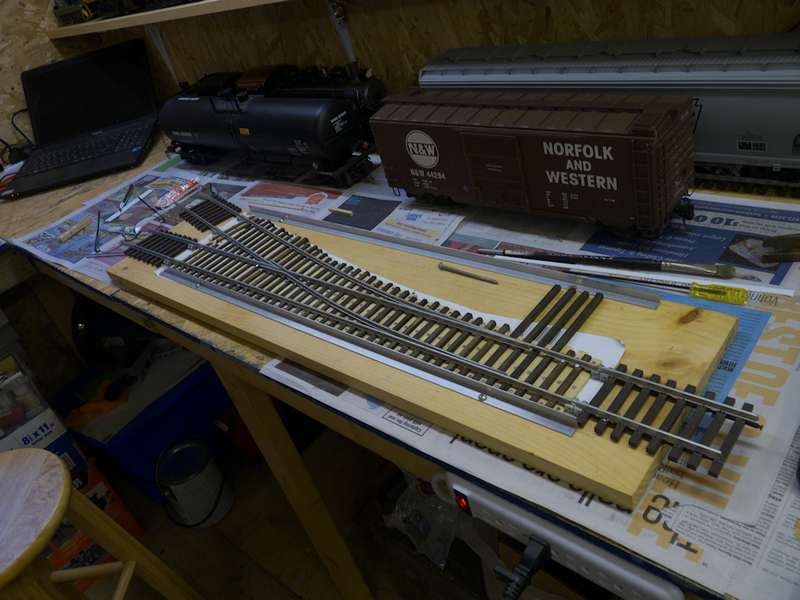 Here are the steps I use to build a G Scale Turnout. This is a process that is going to take some time, so be prepared for that. I typically spend a week or three working part time on one so you have to like to make this sort of thing. Also, for best results, you are going to have to make a Jig to build them on. I built my first one on a piece of foam so you can do it that way but I don’t recommend it. You will also need a bench grinder. This really is a must-have tool to grind the points. They are not expensive, I think I got mine for $35 at Lowes. Other tools required are a set of sturdy needle nose pliers, lineman/electrical pliers, a hammer and a small file or two. Before you start any of that stuff though, you need to make a set of plans that are EXACTLY the size of the turnout. You can download scale pdfs of various turnouts, crossings and other track stuff. By sizing that up by 280%, you get G scale turnout plans. Here is how I have gotten it to work. First, you need to download a free drawing program called InkScape. You can find it here: http://www.inkscape.org/en/ (This is a great program that I also use to make my CNC cuts for my model houses and other buildings, but I digress) You use this program to resize the plan you downloaded. You will also need another program to chop up the finished file into letter page sized printable ‘parts’. It’s called ‘posterrazor’ and you can get it HERE. Once you have these installed, open inkscape and choose ‘import’ from the file menu. Find your pdf (that you downloaded from handlaidtrack.com) and select that to import. Takes a bit, InkScape isn’t a speed demon. Click on the ‘scale’ tab at the top of the window to the right and then click ‘scale proportionally’. Change the width and height to 280 percent (It should be 300 strictly speaking but I’ve found that’s off just a bit so I use 280 instead). Click ‘Apply’ and the image will be resized. At this point, click the little selection on the right that has a percent in it (%) and change it to px so you know the dimensions of the image. Now go to the file menu again and this time choose ‘export bitmap’. 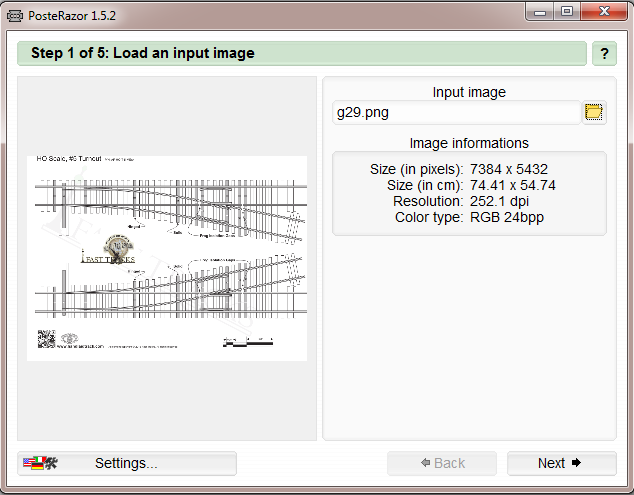 In the ‘Bitmap size’ area, enter the sizes from the step above. Choose an appropriate destination and file name and click ‘export’. I always use the ‘png’ format although I assume bmp would work as well. 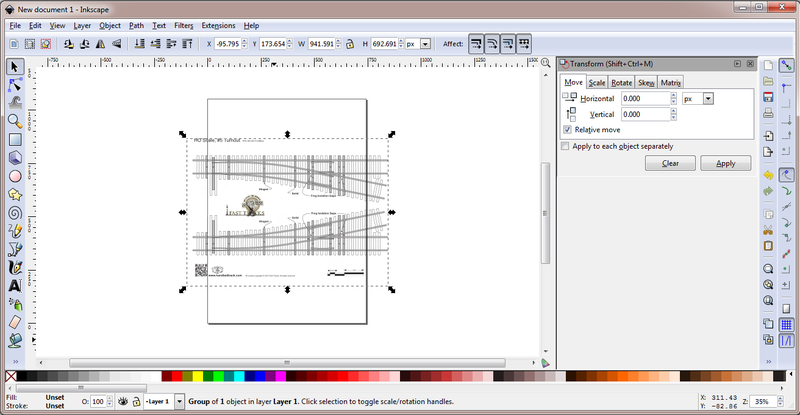 Click next and select ‘letter’ for the paper size and ‘landscape’ for the orientation. Click ‘next’ and just take the defaults presented there. Click ‘next’ again and select ‘size in percent’ and make sure that is set to 100% This should show you an image of how the large image will be broken up into several (many!) sheets of standard printer paper. Click next again and then click the little button under ‘save the poster’ This will create a new PDF sectioned off into the pages you need to print and then tape together to get a complete, full sized plan. Note that for some of the pdfs on the handlaidtrack site, they are broken up into sheets already. You will have to load each of these sheets into inkscape and process each one like this to get a complete plan. While you can build a turnout on a piece of foam, I’ve done it once, It’s far better to make a jig. I built my two jigs, one left and one right, on a piece of 10″ pine board. I take my printed out plan from the previous step and using contact spray glue, paste a copy on both sides of the board. One side I’ll use to actually build the turnout and the other is used to measure and bend the curved parts of the switch and the points. I use two pieces of aluminum angle on the side I build on. One is up against the ties on the straight side, the other is there so when you flip the jig over, (to size the rails and points) it rests evenly on the bench. For the spacers on the jig, be sure they are not too tight, you want a fairly loose fit so you can get the completed switch out of the rig. Once the removed, you will want to glue some reinforcement strips to the bottom, be sure to water proof these too. The ballast should obscure these but they are important to give the turnout rigidity. To actually build the turnout you will need a couple of tools – most importantly, you will need a bench grinder. These can be had at Lowes or Home Depot for about $40-$50. You will need this to grind the points and notch the rails. I discovered a hand file is just not going to cut it. For ties, I use poplar 1/4″ sticks I get from Lowes in the wood trim department. I cut them to size, then soak them in wood stain for a couple of days. Once they are good and soaked, I let them dry for a few days, then coat them with polyurethane. THIS IS VERY IMPORTANT if your railroad is outside in wet conditions as the ties will rot quickly without it. Another tip I found is use real model rail spikes. I made mine from small brads at first and they do work but the spikes are way way easier to use and hold much better. For the switch throw, there are various ones on the market, I use waterproof servos and a magnetic clutch for mine.